The Waste Sector in India has been the most ignored among the various profit-making sectors in the country. Recent changes in the Waste Management Policy by the Ministry of Environment Forest and Climate Change (MoEFCC) helped in developing the waste management industry in India. The Government of India has now launched a web-based application on Integrated Waste Management System (IWMS) for better management of waste. Click here to view this Web-app. The IWMS Web-App was launched by the Environment Minister Shri Prakash Javadekar. The Minister informed about the benefits of this Web-App and informed how it will provide an opportunity to all the industries dealing in hazardous waste and will enable them to apply online. The Minister also said that the user-friendly application can also track the movement of hazardous waste and will also help in ensuring its proper management. Shri Javadekar pointed out that there are an estimated 43,000 industries dealing in hazardous waste, of which about 30,000 industries have been mapped through this application. 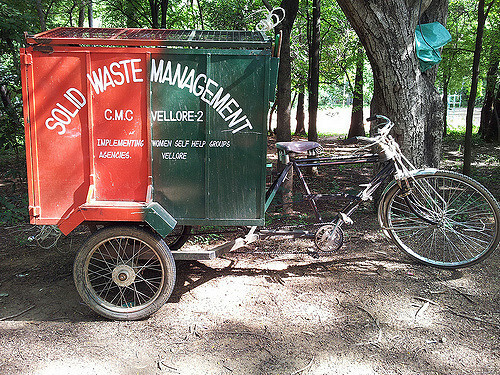 The objective of the IWMS Web-based application is to enhance transparency in the working of the Ministry and other Centre/State level regulatory bodies and also to reduce the time taken for processing applications, seeking various types of permissions under the recently notified waste management regulations. In addition, it provides a single window access, and is is expected to expedite the way the permission is granted and way the analysis could be done not only for authorization and consents, but also for import/export permission under the rules. Help people to apply and get online permissions for import and export of certain categories of waste, which is for reuse or recycling or recovery or co-processing and ultimately to conserve our primary resource. Help authorities in web-based processing, generation and grant of various types of certification/ permissions to the entrepreneurs and industries. Implement concept of paperless/ green office; the system has inbuilt arrangements for uploading the supporting documents / annexure, along with the online applications. Provide an insight to the number of authorization/ certificates granted under consent to establish, or consent to operate, from time to time across the country and make available at any point the information regarding number authorizations / consent orders granted by the State Pollution Control Boards. Enable user agencies to check the fate of their application any time through this web-based portal. Generate database on waste generating/ processing industrial units under construction, or operation by consolidating the information regarding Consent to Establish, Consent to Operate and Authorization, import/export permission. The IWMS Web-App will therefore lead to availability of State-wise and national database on generation of various types of waste and number of waste generating/ processing industrial units in the country at one place. This will help the authorities further to identify the problem areas and plan accordingly. It will also encapsulate all the information from state bodies and provide consolidated information at one place, which will help the Central and State authorities for effective monitoring. Hopefully this will be the next step in India towards formalizing our waste sector and converting it from now dealing in a few lakhs to dealing in crores and multi-crores soon! Such a transition will promote recycling and reduce the existing burden from our landfills.